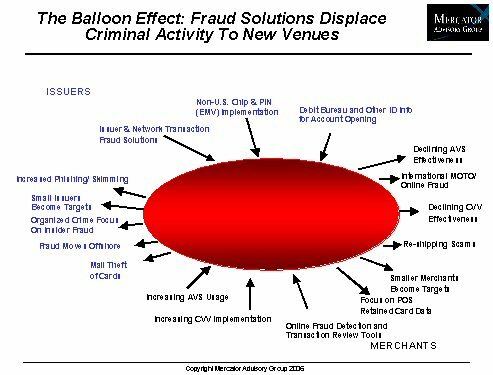 This individual Report Credit Card Fraud Update: Silos Versus The Balloon Effect is available for purchase. This Report is available to members of Mercator Advisory Group’s Credit Advisory Service. Please be advised that this Report is normally part of a research and advisory service that provides ongoing support throughout the year. As such, this Report contains significant depth of content that is selected for its strategic importance to our members. (For a description of these services, see our Advisory Services section). While credit card and other types of financial fraud are detected and reported within organizational product and business line silos, fraud follows a dynamic "balloon effect", migrating to less well defended areas. Large financial institutions may envision a more comprehensive approach to detection of fraud and financial crimes, but organizational commitment and solution development typically lag the balloon effects of fraud. While the credit card industry and online merchants focus on narrow fraud metrics, the uncounted costs of fraud, their "dark numbers," are in all likelihood significantly larger. Credit card issuers are demonstrating an ability to manage transaction and application fraud within sustainable parameters. Online merchants, after significant investment in fraud solutions, are similarly moving toward a sustainable fraud level, despite their rapidly growing sales volume. From the standpoint of the credit card industry, the most typically reported and accepted quantification of card fraud are annual issuer losses. For 2005, these were estimated at about $1.1 Billion for Visa, MasterCard, American Express, and Discover combined (source: Nilson Report). Yet this estimate is clearly just the tip of the fraud iceberg, which affects issuers, merchants, and consumers. While the costs of some frauds can be measured, others comprise the unreported and unmeasured "dark numbers of fraud." Ken Paterson, Director of the Credit Advisory Service at Mercator Advisory Group and the author of the report comments that, "the dark numbers of fraud, while by definition unknown, are surely the largest. A significant component is the opportunity cost incurred by both merchants and credit card issuers in declining transactions that are suspected as fraudulent but are in fact legitimate (perhaps 4 out of 5 transactions that are declined by online merchants), as well as potential shopping behavior that is dissuaded by consumer fear of fraud." Unreported and undetected fraud at issuers is also certainly significant, and probably ends up classified as a credit loss. Fraud may end up in the collections file, potentially inseparable from bad debt. Indirect victimization costs should be considered. Among individuals, the direct financial costs of investigation, recovery, and credit record repair are included, as well as the "soft" costs of personal time and anguish spent on recovery.